A very talented player, but with a long list of off the court problems -- sound familliar? Has a history of substance abuse along with other issues, but seemed to turn a corner the past 1 1/2 years. Was a huge recruit out of high school and signed with hometown Boston College, but only lasted 1 game there before getting injured, and eventually transferring out. 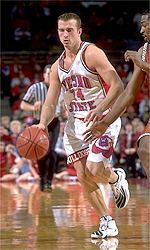 Resurfaced at Fresno State under Tarkanian and has been a starter there ever since. Spent the past season solely at point guard, whereas the previous two seasons played alongside the likes of Dominick Young and Rafer Alston at the 2 spot. Played the point well, finishing among the nation's leaders in assists. Struggled with his shot, however, and injuries were a problem all year long. Even got hurt before the Desert Classic which will cost him some status in the draft. Streaky shooter from the outside, and simply unacceptable from the free throw line. Plays with a real swagger that could remind some of Jason Williams of the Kings. Probably 1st round talent, but history of drug problems are keeping some teams far away; but then again, that didn't stop Williams from being a lottery pick. Tough senior year however, so 2nd round status seems likely.